Whoever thought to make a dessert out of carrots was sort of genius. Who would have thought that shredded carrots would be yummy in birthday cakes or cupcakes? 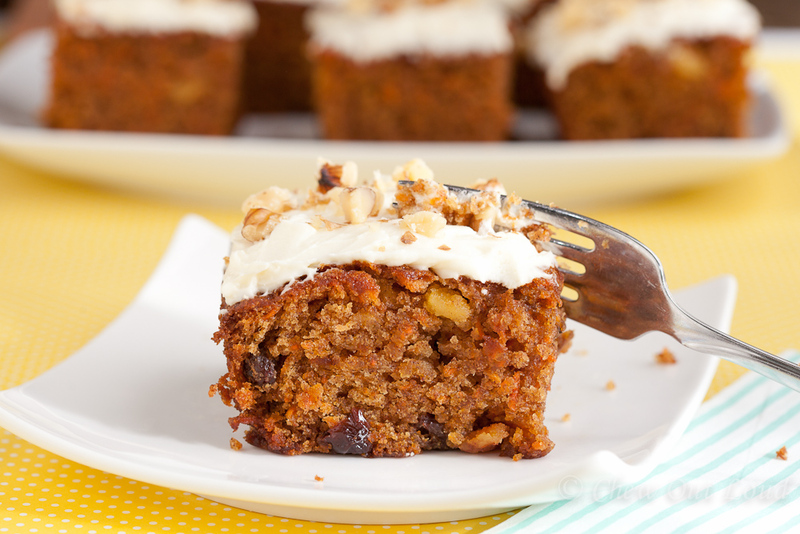 Carrot cake is one of the most beloved flavors today, and for good reason. Armed with a great recipe, anyone can bake up a superbly moist, tender, and addictive carrot cake. 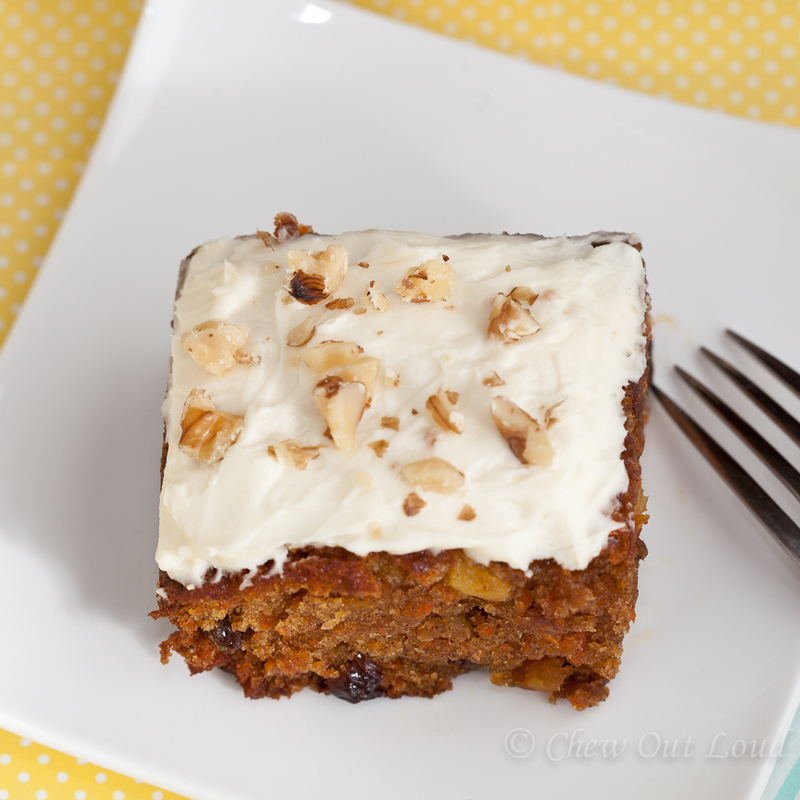 My kids know this yummy treat is called carrot cake, but I doubt they realize there is an abundance of freshly shredded carrots in their dessert. Lots of good-for-you carrots. Plenty of plump raisins. Walnuts, if you like them. Extra raisins if you don’t. Over the years, I have made carrot cake in the form of bundts, loaves, and cupcakes. This time, I opted for a simple sheet cake. Easy and fail-proof deliciousness. 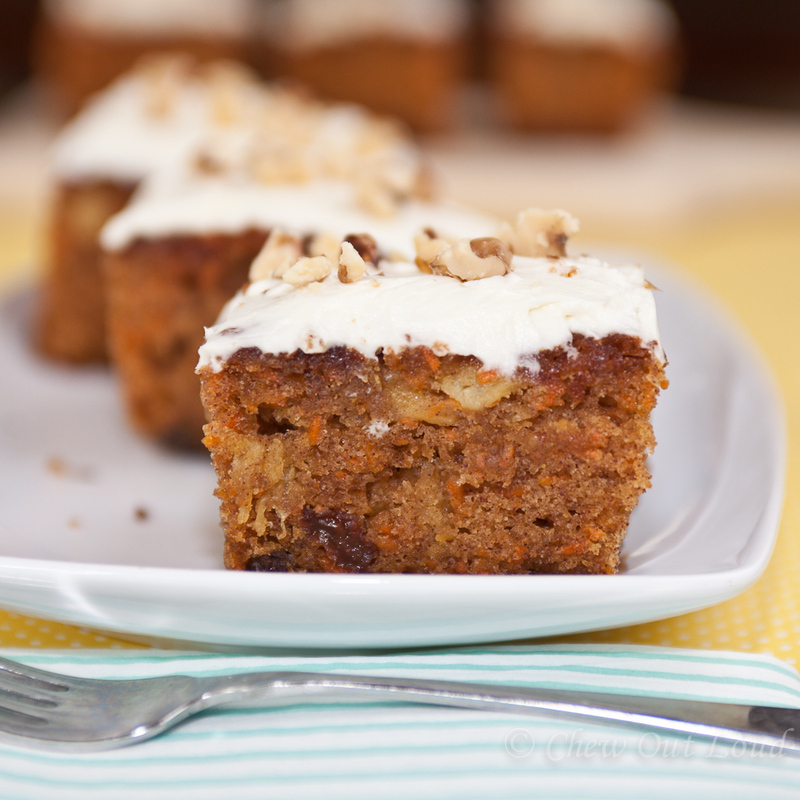 This fabulous carrot cake recipe is one I’ve loved ever since an old friend shared it with me ages ago. It’s one of those well-loved recipes that has years’ worth of chicken scratch written all over the margins and is fraying along the edges. 1. Preheat oven to 350F with rack on lower middle position. Press a long sheet of foil into a 9×13 pan, with extra foil hanging over edges for easy cake removal. Grease the foil. 2. Sift together flour, baking powder, baking soda, salt, and cinnamon, mixing well. Form a well in the center. Add sugar, oil, and eggs into the well and mix wet ingredients by hand. Fold into dry ingredients until fully incorporated. 3. Fold in carrots, pineapple, raisins, and optional walnuts. 4. Bake in greased, foil-lined pan about 45 minutes or until toothpick comes out almost clean. Cool and remove with foil sling. Frost as desired. Combine butter, cream cheese, and vanilla. Beat well. Add sugar gradually and beat well. If too thick, add small amount of milk. If too thin, add small amounts of sugar until desired consistency is reached. Frosting naturally thickens and firms up as it sits.